Thank you for sharing the link on the online tutoring post!!! I am a 5th grader in TX and I would love to hear your advice on science, something I am worried for. The test is coming up, and I am learning about Interdependency and Food Chains. Plz give some awesome advice ! Interdependence and food chains are important topics. I think the best way to approach it would be to think in terms of the big picture of life. 1.) Producers: Those that produce their own food, such as plants and algae. As you can probably guess, they are called Producers because they produce their own food. Another term you might see for them are autotrophs. The word 'auto' or self should help you remember it. 2.) Consumers: Those that must eat other animals to survive. They are called Consumers because they consume other forms of life. The scientific name for them is heterotroph. 'Hetero' means mixed. There is an almost unlimited chain of consumers. They use the term primary for the first ones that eat the producers, like bugs who eat leaves. Animals that eat the primary life forms are called secondary consumers. A frog eats bugs, so they are secondary. Something that eats frogs, like snakes, would be a tertiary consumer, etc. Final consumers are at the top of the food chain. Humans are considered to be final consumers since we normally have no problem with other animals eating us. There is a special class of life called decomposers. They can eat anything, but mostly eat dead animals. Things like fungi (mushrooms) and bacteria live on dead decaying life forms and break them down, or decompose them to their basic chemical elements, such as carbon, nitrogen, and oxygen. They fuel the circle of life, since plants need these elements to properly grow. They are natures great recycling center. It all comes down to energy. All life forms need energy to exist. They either make their own or eat other living things. The ones that make their own energy still get it from another source, but not another life form. For example, plants make energy from the sun and the sun is what allows them to make it using a process called photosynthesis. Plants and algae make chlorophyll from the sun. They use this for food. 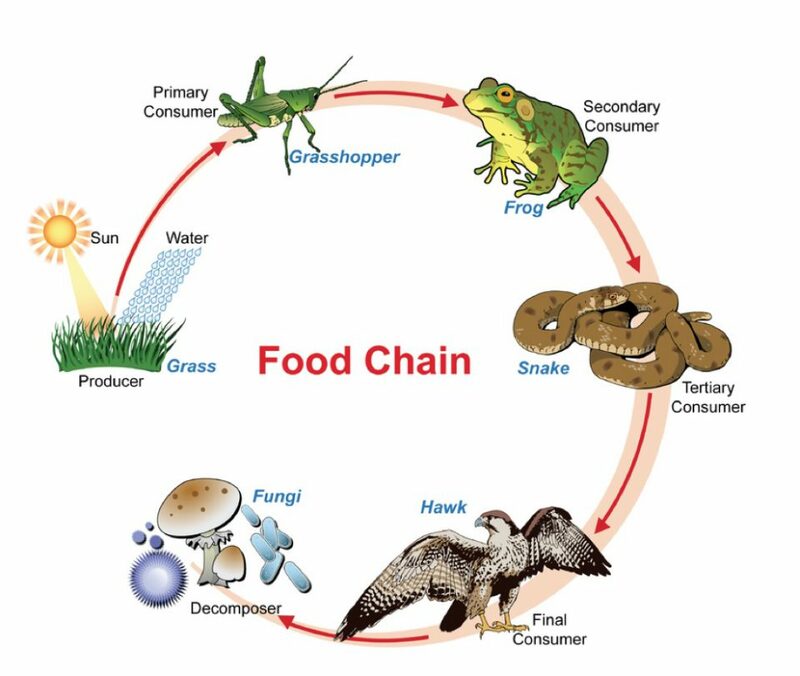 The food chain is just a list of species and who they usually (but not always) eat for food. Bigger and stronger animals tend to eat weaker animals. However, this is not always the case. Whales live on algae and cows live on grass. The food chain helps people keep track of it all. Humans are usually at the top, but you might not be if you are lost in the jungle without weapons. Tigers might eat you. It is important to remember that everything is dependent on each other. If we don't have plants, the animals that live on them would starve to death. Plants need a good environment to grow, so things like global warming are bad for them and all other life forms because of the interdependence. It is a simple concept when you step back, but has huge importance when it comes to our environment. If just one species is gone, it impacts all the species above it since they have less food sources. It ultimately impacts the human race too, so our survival depends on the food chain and protecting it. commented 3 days ago by Ammy K.
who is ur bias ? Are you an ARMY ?